For those who wish to learn the extensive traditions developed as ‘sushi etiquette’ over the years that the Japanese have been eating sushi, I have moved this section to a page of it’s own. Originally a post in my blog, Sushi Otaku, the comprehensive list of rules for eating sushi by traditional manners continues to expand and develop. I encourage you to visit the How to Eat Sushi (Sushi Etiquette) Page. Who is this person preparing the food and can I pester them with questions? The terms “Itamae” and “Shokunin” are used as a title for the chef. “Itamae” refers to a skilled sushi chef, while Shokunin means simply someone skilled at a profession. If the Itamae is not too busy and you have a question, ask away! I often talk to the chef as he is working, both because I am always interested in learning new things and because when I drink enough sake, I don’t shut up. One good question to ask, if you don’t know what you are eating, is `kore wa nan desu ka?’ If he doesn’t laugh at you for your atrocious pronunciation, he just may tell you! And at any decent restaurant they often have items that are not on the menu (e.g. monkfish liver, a personal favorite). By all means ask for unusual items if you want to, or even if they have something that you may have never tried, you may be in for a pleasant surprise. How can I impress the Itamae? Do you know any expressions? Domo – Thank you, not as polite as arigato. Domo and arigato can be combined (“domo arigato”) and then become a more polite form of thank you. Domo arigato gozaimasta – Another very polite form of thank you, said after the meal or activity has concluded. Okonomi – Ordering sushi a few pieces at a time. Omakase – Colloquially meaning “Chef’s choice” and pronounced “oh-mah-kah-seh,” this style of dining essentially offers the itamae the choice of what to serve you based on what he feels best represents his skills and what is available at that time. What kinds of preparation techniques are there for sushi? Food is often cut or prepared in certain ways to make it more interesting and attractive. 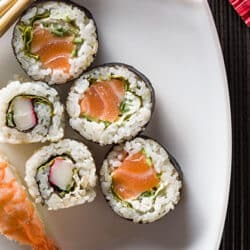 For a detailed list of the different styles, browse the sushi basics page where you will find the styles explained and images to help you identify any particular ones you are looking for but may not know what it is called. Are the grooves in my Ika (squid) natural? It looks like a hand grenade. The chef cuts the grooves in the Ika himself. This makes the Ika easier to bite as well as look really funky. Norm Delson chimes in with `BTW, a decent roll you may find is a pine cone roll where the squid is cross hatched and used in place of nori. Filling can be just about anything.’ Sound interesting? You bet. Are there other fanatics like me? Can I meet them? The Boston Sushi Society. They have a mailing list as well, check them out. The Chicago Sushi Club. The contact for the group is Lisa Flores and she can be reached at lisa at chicagosushiclub.com if necessary. The New York Sushi Society. While they have no website, they have a digest. To subscribe send email to majordomo at magpie.com and put `subscribe sushi-digest’ without the quotes in the body of the message. The Tampa Bay Sushi Society. Join Tampa Bay Sushi Society today and receive discounts at area Sushi Restaurants and select businesses. What more could you want. The Toronto Area Sushi Society. For those of you in the Great White North, check out this group of sushi-goers in Toronto. News, Reviews, all the good stuff. The Tucson Sushi Society recently stared up and is recruiting members. Their website won’t be up until sometime in January, but interested parties can email Larry Edwards at either tucsonsushisociety@hotmail.com or tucsonsushisociety@yahoo.com for information.